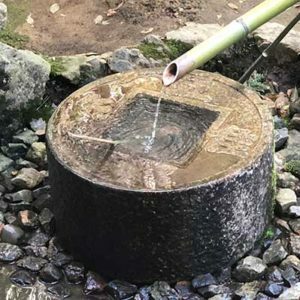 Increasingly popular, and suited to both large as well as smaller gardens, Japanese garden ornaments come in a range of styles. They are also available in a range of materials, from concrete replicas to more original granite types. 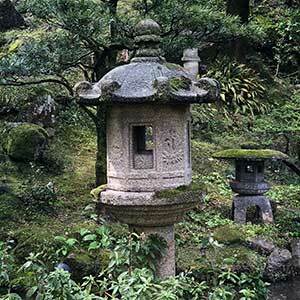 One of the most common forms is the lantern types, these come in a range of sizes, and again in different materials. prices range according to material with concrete being the cheapest. Bowls are also popular with Tsukubai being placed at the entrance to shines to allow travellers to wash their hands before entering. Other forms include Tetubachi, Kozenibatsi, Ginkakuji Mizu Bachi and Natsumi are other forms. Guide Posts that can be used as lights beside pathways are also popular, traditionally used with candles, some can be retrofitted with electric lights. Pagoda statues of versus sizes are also available, again the concrete types being the cheapest. You can also add a range of Japanese wind chimes and statues, all designed to add to the overall effect in a Japanese style garden design. We have pictured ornaments from real Japanese gardens. They have a patina of age that can be be recreated on new ornaments by encouraging moss and lichen to grow on them. The ageing of ornaments will assist with obtaining the element of antiquity which is explained on our video on Japanese garden design. Lanterns can be found that are pre drilled to allow for easy fitting of lights if required. Japanese Garden Ornaments are available for sale at the following suppliers.